There are many varieties of Acorn squash and they come in several colors. The most common color is dark green. 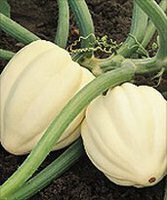 Newer varieties include Cream of the Crop which has a wonderful cream color and Glowing Acorn which has a glowing yellow orange color. Although they are considered a winter squash, acorn squash belongs to the same family as summer squashes like zucchini. Preparation : Acorn squash are HARD. You need a sharp knife to cut them. You can make the cutting easier by piercing the skin in several places and microwaving the whole squash for about 2 minutes. The skin will then soften somewhat and be easier to cut. Let the squash cool briefly. To half the squash, cut from the stem end to the other end. You need to remove the fiber and seeds from the center of the squash before baking or serving. If you are going to bake the squash halves, cut a small piece from the curved bottom of the squash so it will set flat on the baking dish.